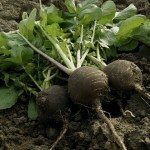 An easy, rapid growing crop, radishes are usually grown for their delicious, peppery root. Radishes mature anywhere from 21-30 days from seeding whereupon the root is ready for harvest, but have you ever wondered if you can eat the radish greens? If so, what can you do with radish leaves and how to harvest radish greens? Yes indeed, you can eat radish greens. 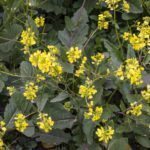 In fact, they are super nutritious and delicious, tasting much like their relatives turnip greens or mustard. So how come many of us have never tasted this culinary delight? Many varieties of radish have foliage peppered with slight hairs. When eaten, these hairs assault the tongue with an unpleasant prickly sensation. This is no doubt a defense of the plant which, after all, does not want to be eaten; it wants to continue to mature into seed pods. Seed pods, by the way, which are also edible! There are, however, a number of radish varieties that claim to be “hairless,” apparently making them excellent choices for salad greens. I love the idea of using the entire plant and White Icicle, Shunkyo Semi-Long, Perfecto and Red Head are all radish types that can be grown not only for the root, but also the delicious greens. Some seed catalogues that specialize in Asian veggies even have a category called leaf radish. These radishes, such as Four Season and Hybrid Pearl Leaf, are grown primarily for the foliage which is used in Korea for making kimchee. It seems evident that there are plenty of options for harvesting of radish leaves. The question is, when to harvest radish leaves? Begin harvesting radish leaves when they are young and tender and the roots are just forming. If you leave harvesting too late, the stems get tall, the roots pithy and seed pods form while the leaves become bitter and yellow. Because they grow so quickly, if you want to have a continuous supply of greens, re-seed about halfway through the maturation of the first sowing. That way, you will have another harvest ready to reap soon after the first, and so on. There is no secret to harvesting radish leaves. You can snip them off at ground level or pull the entire plant. Separate the root from the greens by cutting it. Wash the greens free of dirt and you are ready to use them. They can be tossed into salads or tucked into wraps or sautéed; only your imagination limits their use.